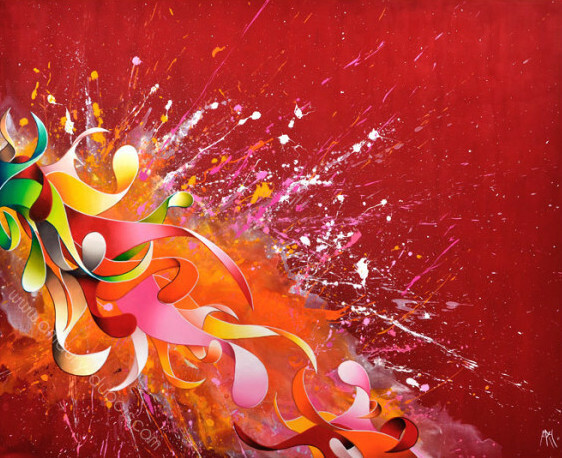 Meet Artwork Archive Artist Amaury Dubois. 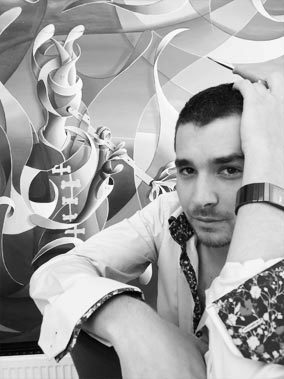 Although he was once told painting is not a real profession, this former graphic designer is gaining momentum across the French art scene and beyond. 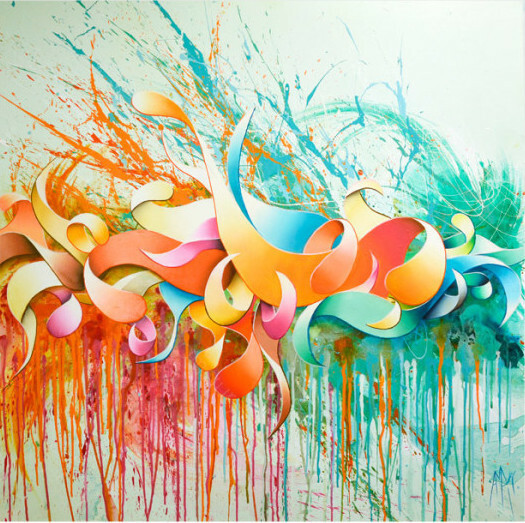 His paintings echo the color and luminosity of his digital designs, yet have taken on an aesthetic completely their own. His work has caught the eye of companies from Mercedes Benz to McDonald’s, further cementing his credentials. Amaury shares what it’s like to partner with corporations, how he chooses work to sell on Society6, and why following your passion is so important. 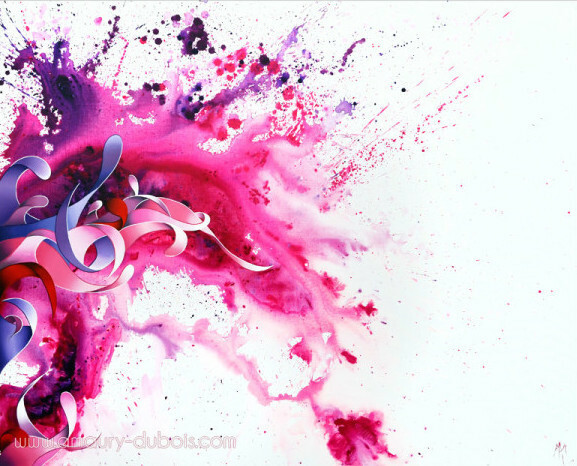 Want to see more of Amaury Dubois’s work? Visit his Artwork Archive Public Page. 1. HOW HAS YOUR BACKGROUND IN GRAPHIC DESIGN INFLUENCED YOUR ARTWORK AND WHY DID YOU DECIDE TO BECOME A FINE ARTIST INSTEAD OF A GRAPHIC DESIGNER? 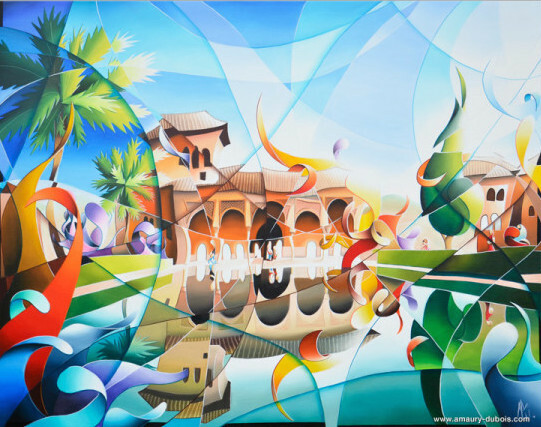 Graphic design was a stepping stone for me, but I always wanted to be a painter, an artist. Being a graphic designer was the closest to what I actually wanted to do. I was able to make a living creating something that I liked: something to do with drawing. My time as a graphic designer influenced the luminosity and colors of my art because the luminosity of a screen is not like that of daylight. My eye has adjusted to seeing colors that way. 2. 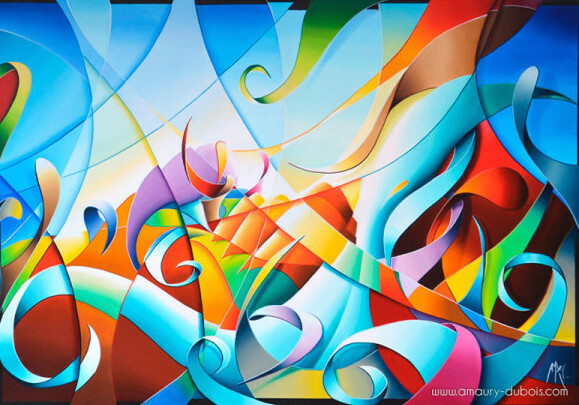 YOUR ARTWORK IS AN EXPLOSION OF COLOR WITH ABSTRACT, CURVED SHAPES. HOW DID YOU DEVELOP YOUR UNIQUE STYLE OF CURVISM? It didn’t happen instantly, but one day I took a canvas and brushes and created a painting in that style, full of color and curves. Since then my aesthetic has evolved into the “curvism” it is now. This style was in my head and it has developed. When I started to paint, this came as an obvious fact. This is the way I see the world. It is a way of seeing what surrounds us and the forms which exist, as well as the way the light reveals them. 3. YOU CREATED A DESIGN FOR THE SMART CAR. HOW WAS THE CREATIVE PROCESS SIMILAR AND/OR DIFFERENT TO YOUR USUAL STUDIO WORK? I had a technical constraint. When we make something for ourselves, we make what we want. When I paint, it is for myself. I had to look for my freedom within the constraint. When there is a customer and his expectations, there is an additional challenge. I have to imagine what that person envisions, but I still need to keep my own identity. Creating the design for the Smart Car was a good experience that I appreciated a lot! I look forward to doing this kind of project again. 4. HOW DO YOU BALANCE YOUR TIME BETWEEN CREATING ART AND THE BUSINESS AND SELLING ASPECT? I focus a third of my time on selling my art and two-thirds on creating it. My purpose is to create art, but it is also necessary to sell it. As I like to say: “ I don’t expect that the train passes in my workshop.” The time we spend selling art–even if it’s less than the time we spend creating it–is the most tiring part of an art business. We do not always get the result we want, whereas when we create art the result is in front of our eyes. Trying to sell your art can be discouraging, but we need to sell if we want to continue the job we like. I have to try to touch the hearts of the right people, to find my public. 5. YOU HAVE PARTNERED WITH MERCEDES BENZ, MCDONALD'S, AVIREX, NORPAC, AND OTHER CORPORATIONS. HOW DID YOU GET INVOLVED WITH THESE COMPANIES AND HOW HAVE THESE PROJECTS BENEFITED YOUR CAREER? All the companies had their own ideas and I had to propose something which corresponded to their expectations. What is interesting is that I have to start from scratch every time because the companies do not have the same needs. It’s like learning a new job for every company. I think it’s great to create art for companies or to exhibit artwork thanks to them. I cannot quantify what that brings to my career, but it has a positive impact on my reputation. It shows other companies and my customers that I’m a serious artist, which gives me credibility. 6. YOU SELL YOUR ART ON SOCIETY6 AS PRODUCTS AND PRINTS. HOW DID YOU DECIDE WHICH ARTWORKS TO FEATURE AND WHAT HAS THE OVERALL EXPERIENCE BEEN LIKE? I only put my works on paper (ink and charcoal) on Society6, not my paintings. In my mind there is something sacred in my oil paintings. Maybe I’ll change my opinion one day, but for the moment I am not ready. The derived objects are new, we wanted to try it because I have regular demands. We will see how it does and if it deserves to be developed more. 7. IS THERE ONE THING YOU WISH SOMEONE HAD TOLD YOU ABOUT BEING A PROFESSIONAL ARTIST WHEN YOU BEGAN? I regret, rather, that people told me that being a painter was not a real job. Today, I proved them wrong. I don’t regret it. I get up everyday to do a real job which I like. The passion is what’s most important. Without any pretension, I knew what to expect on the difficult path of a professional painter. No matter what we are told, advice or warnings, we have no choice but to follow our calling. Want to Grow Your Art Business Success and Receive More Art Career Tips? Sign Up for Free Here. Jeanne Bessette was once told “artists can’t make a living,” now she is collected all over the world. Learn how this painter built a business that supports her passion. Artist Dan Lam creates vibrant, amorphous sculptures that drip off of bookshelves, almost demanding to be touched. Chicago artist Jordan Scott painstakingly assembles thousands of canceled postage stamps. The result is an unbelievable canvas, filled with history. See what these artists had to say about why they chose to go with Artwork Archive to manage their art inventory and business.